FTC Disclosure: Book received at no charge to facilitate review. "You have been chosen to lead a team of detectives..." It is up to you to use your head to solve the burglary at an apartment building. Brush up on your math skills, you're going to need them. Do you have what it takes to join the team? Koll and Mills explore the math concepts of deduction, using a grid, interpreting statistics, ratios, and more. Using these concepts in a real life scenario helps young readers develop skills in a way that is both interesting, fun, and challenging. Those who struggle with numbers and how they relate outside of the classroom will have some "aha" moments. 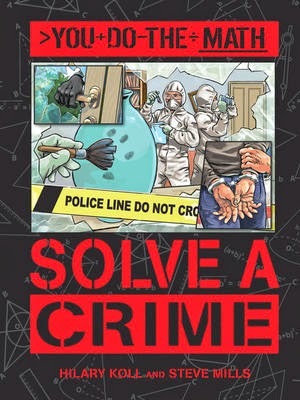 Besides building math and reading skill, Solve a Crime gives an inside look into what it takes to be a detective. Not just the idolized version of it, but the mundane work and attention to detail that is part of the job. Recommended for those who want to learn how math fits into the "real world."